Forecast models have been targeting this feature for days now. 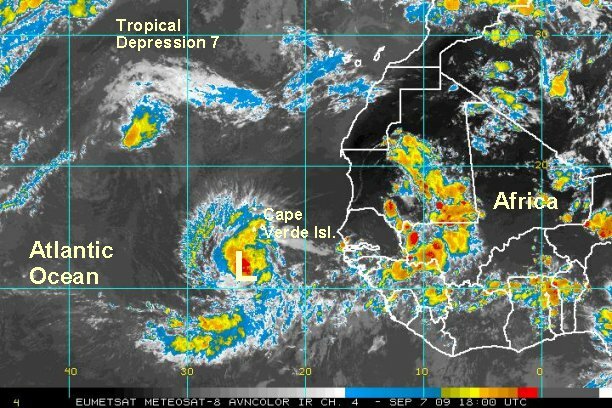 Deep convection is associated with tropical depression 7 with thundershowers and breezy weather moving though the Cape Verde Islands. This new depression is going to be what my colleagues and I at The Weather Channel coined about 25 years ago - a fish storm. This simply means that this tropical feature should harmlessly stay out to sea. There is a remote possibility that the Azores may need to deal with what will become Fred many days down the road. 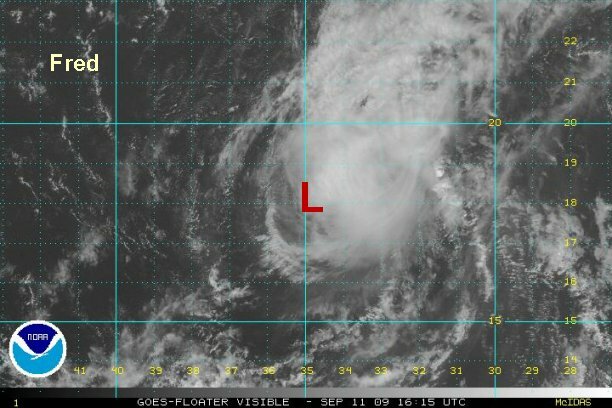 At 5 pm edt / ast tropical depression 7 was centered at 12.5° N / 24.5° W or about 160 miles south of the southern Cape Verde Islands. Conditions appear favorable for slow strengthening and for this feature to become a tropical storm. Top sustained winds are at 35 mph. It is moving west at about 16 mph. 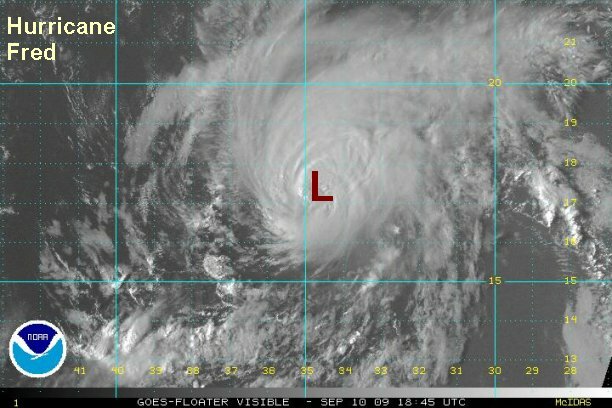 Satellite imagery show that Fred's structure has improved overnight. Banding has intensified on the southwest side of the circulation. Sometimes a hurricane can rapidly form if this type of banding wraps around the center and forms an eyewall. Forecasts continue to show Fred turning northward in a few days. Fred will become a hurricane and remain well out to sea. An upper level trough will start shearing Fred late this week. 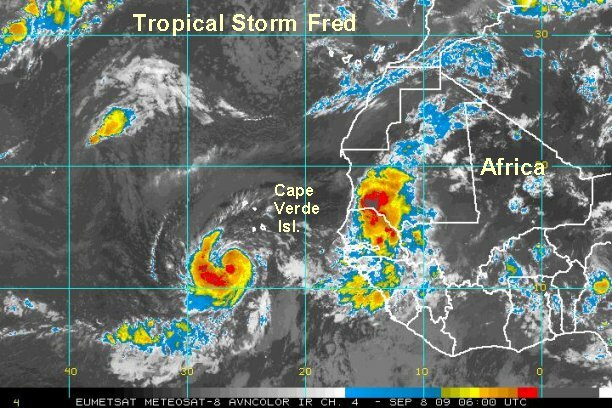 At 8 am edt / ast tropical storm Fred was centered at 11.8° N / 27.5° W or about 300 miles southwest of the southern Cape Verde Islands. Conditions are favorable strengthening and Fred will likely become a hurricane in the next 24-36 hours. Top sustained winds are estimated at 50 mph (NHC 50 mph). Fred is moving west at about 15 mph. The banding feature that formed earlier today on the southwest side of Fred has indeed wrapped around the center of circulation. This has allowed Fred to steadily strengthen today to the point of almost being a hurricane. Deep convection is building near the center of circulation. We don't think Fred is quite as strong as NHC, but 5 mph isn't much of a difference. Tropical storm Fred will become a hurricane soon and turn northward before being sheared. At 5 pm edt / ast tropical storm Fred was centered at 12.1° N / 29.8° W or about 410 miles west southwest of the southern Cape Verde Islands. Conditions are favorable for strengthening and Fred will likely become a hurricane by later this evening. Top sustained winds are estimated at 65 (NHC 70) mph. Fred is moving just north of due west at about 13 mph. If you are taking a cruise or traveling to the Caribbean, Bermuda, Mexico, or Hawaii and are concerned about the trip, post in the "eye of the storm" forum and I'll try to answer your questions. The National Hurricane Center is upgrading Fred to a 75 mph hurricane at 11 pm edt / ast. This looks reasonable as an eyelike structure is starting to appear on the I.R. satellite imagery. There is no major change to the forecast - well out to sea. Hurricane Fred has strengthened some overnight, helped by the excellent outflow on the northeast quadrant. The Hurricane Center has stated that Fred has undergone a rapid deepening phase overnight noted by the very cold cloud tops. We are not as bullish on the strengthening. 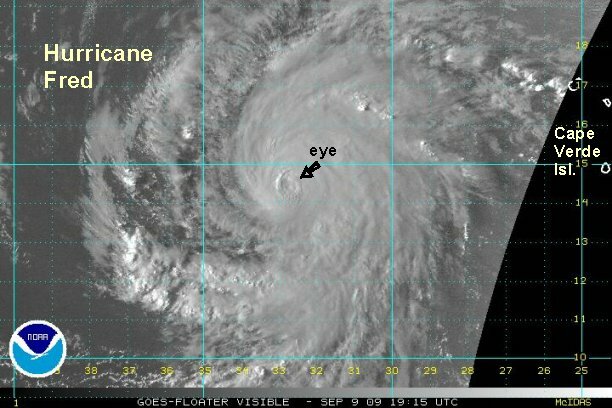 Even though cloud tops have cooled, it appears that the eyewall is still not solid with a weakness on the northwest side. We would classify this as a modest deepening phase not rapid. It also appears that Hurricane Fred is fighting some westerly shear which will become more easily discernible as the first visible satellite images of the morning arrive. 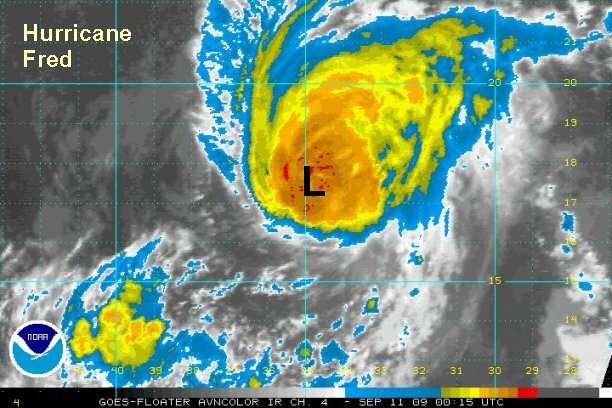 At 5 am edt / ast Hurricane Fred was centered at 13.2° N / 31.7° W or about 500 miles west southwest of the southern Cape Verde Islands. Top sustained winds are estimated at 90 (NHC 105) mph. Fred is moving west northwest at about 13 mph. 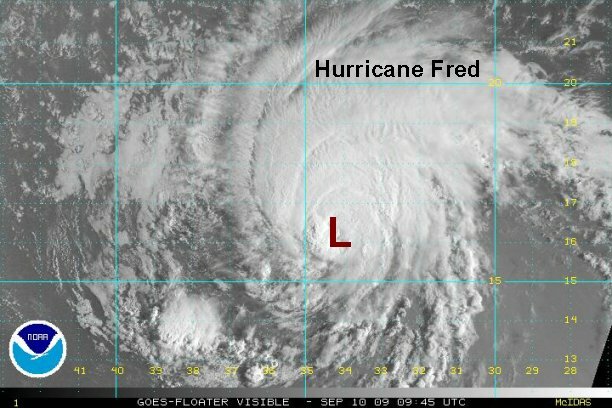 We are now on the same page as NHC on Fred. Fred has indeed rapidly strengthened over the past six hours as the eyewall has completely closed off and expanded. Outflow aloft has improved in all locations, even though it still appears to be somewhat restricted on the west side. Excellent outflow enables a hurricane to strengthen quickly and stay strong. Additional strengthening is possible before wind shear weakens Fred later this week. From the Tropical Prediction Center record book.....Fred is only the third major hurricane observed east of 35° W since records began.....and the strongest southeast in the Atlantic. NHC correctly states that it would have been difficult to tell if there were others before the satellite era of the 1960's. 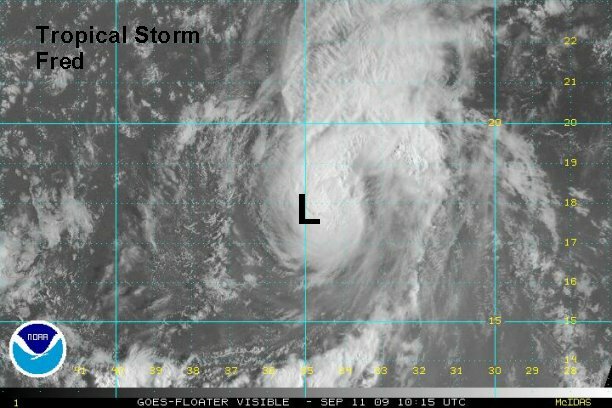 At 11 am edt / ast Hurricane Fred was centered at 13.9° N / 32.4° W or about 540 miles west southwest of the southern Cape Verde Islands. Top sustained winds are estimated at 115 (NHC 120) mph. Fred is moving northwest at about 14 mph. After a period rapid development this morning, hurricane Fred has leveled off or has even weakened a small amount. 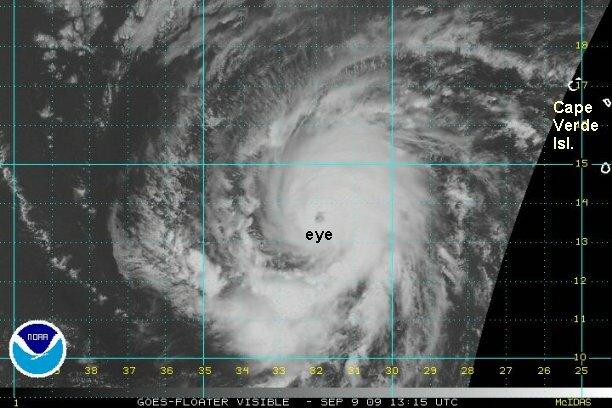 Fred's eye is now obscured by clouds and it appears that cloud tops in the eyewall have warmed a little. If one were to only look at the visible satellite imagery no noticeable changes are readily apparent. We think Fred topped out a few hours ago at near 120 mph and has slipped back to about 115 mph. Outflow still looks excellent on the eastern half of the circulation with some westerly shear on the west side. At 3 pm edt / ast Hurricane Fred was centered at 14.6° N / 32.9° W or about 560 miles west of the southern Cape Verde Islands. Top sustained winds are estimated at 115 (NHC 120) mph. Fred is moving northwest at about 14 mph. NHC dropped their winds down to 115 mph to at 5 pm edt to match our estimate. Facing southerly wind shear, hurricane Fred has weakened overnight. Deep convection near the eyewall is not that impressive either. A recent microwave satellite estimate only had the winds at 77 knots. With this being the case, our estimate is lower than the Hurricane Center's 105 mph. At 7 am edt / ast Hurricane Fred was centered at 16.3° N / 34.2° W or about 585 miles west of the northern Cape Verde Islands. Top sustained winds are estimated at 90 mph (NHC 105 mph). Fred is moving north northwest at about 12 mph. Forecasts generally snake Fred northward then northeastward as it weakens under wind shear. An eventual northwest or westerly turn is possible if the convection gets stripped and a low level circulation only remains. Hurricane Fred has changed little in intensity today. It has turned to just east of due north and has slowed considerably. Southerly wind shear continues to keep convection on the north side of the circulation. At 4 pm edt / ast Hurricane Fred was centered at 17.4° N / 34.5° W or about 600 miles west of the northern Cape Verde Islands / 760 miles west northwest of Sal, Cape Verde Islands. Top sustained winds are estimated at 90 mph (NHC 100 mph). Fred is moving just east of due north at about 6 mph. The National Hurricane Center dropped their winds to 90 mph on the 5 pm edt /ast advisory to match our wind estimate. The overall intensity and direction has not changed much for the past several hours. Hurricane Fred is moving north slowly. Deep convection is holding on despite the southerly wind shear. At 9 pm edt / ast Hurricane Fred was centered at 17.7° N / 34.8° W or about 780 miles west northwest of Sal, Cape Verde Islands. 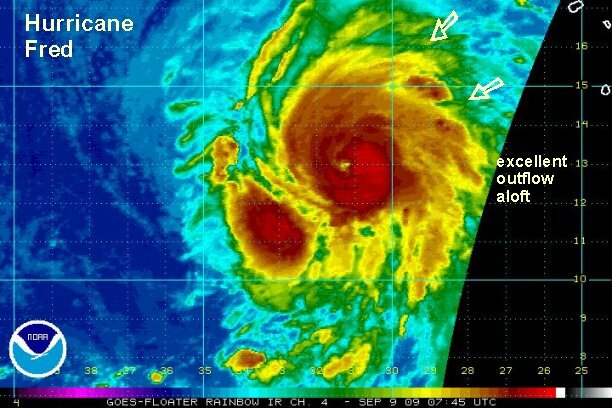 Top sustained winds are estimated at 90 mph. Fred is moving north at about 6 mph. Forecasts move Fred northward slowly, then west northwest as it gets sheared and it directed by the low level flow. Wind shear from the south continues to weaken Fred although it still remains over the center of circulation. Fred will quickly weaken once the shear becomes strong enough to push the thundershowers away from the low center. At 6 am edt / ast Hurricane Fred was centered at 17.7° N / 35.1° W or about 745 miles west of the Cape Verde Islands. Top sustained winds are estimated at 65 mph (NHC 85 mph). Fred is moving north at about 3 mph. Please note that Fred is labeled as 'tropical storm'...officially it is still a hurricane by NHC's estimates. Fred has essentially stopped under weak steering currents. 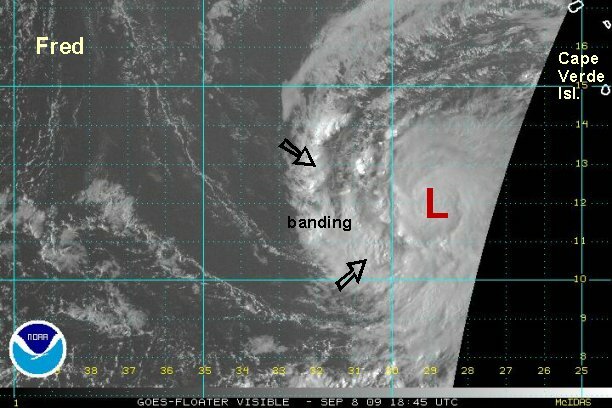 It is also being sheared and it appears that the mid-level center is now removed to the northeast of the low level center. We can not agree that this is still a hurricane. Weakening will continue. At 2 pm edt / ast Hurricane Fred was centered at 18.0° N / 35.0° W or about 795 miles west northwest of Sal, Cape Verde Islands. Top sustained winds are estimated at 60 mph (NHC 80 mph). Fred is drifting barely north. New microcwave satellite wind estimates are in....43-51 knots / 50-59 mph....this is not a hurricane! The National Hurricane Center's 5pm edt /ast advisory just came in with winds still at 70 mph.